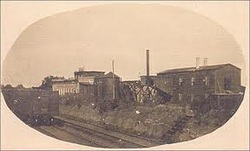 The picture below on the left shows an old mill and boarding house before the civil war. The main influence of the the geography on the work the people did was the north mostly worked in mills and the south mostly worked on farms. The north mostly worked in mills because they did not have good soil for planting much. The north also did logging because they have more then enough trees in the north. In the south the were big on farming especially cotton farming because they had better soil than the south. The south had a lot of slaves to help out with the farms.